Seun Oke arrived in MO yesterday afternoon from Nigeria to a surprise welcome by MU Nigerian students and friends from PET MO-Columbia. She is pictured with Gary Moreau, the Columbia shop executive director, and others. We are working with Steve Baima who is the PET International lead for her PET promotional tour in the US for 2 months. Her tour is starting in MO at the PET conference next week in Columbia and she will then travel to selected other PET locations to share her story. As mentioned in the previous blog, she will be here in Austin, Bryan and San Antonio from October 22 - 26. In addition to her tour stops, Seun will also have time to relax and do some fun things. Arrangements are also being made to help her get some computer training while she is here. PET-Austin is also hoping to raise funds through love offerings to cover the cost of sending a 40' container of PETs (176) to Nigeria in Seun's honor. We are working with our distribution partner, the Assembly of God Missions, in Nigeria to make this happen. 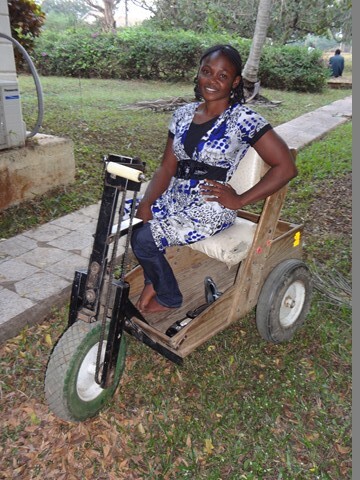 Seun Oke is a Nigerian woman with polio whose life was changed by an all-terrain wheelchair like those built by PET-Austin. Prior to getting a PET® cart, Seun (Shay-OON) had to crawl or be carried to have mobility. Seun will be featured at Bethany United Methodist Church's Saturday 5:00 PM service on October 25 with a reception to meet Seun after the service. She will also be the featured speaker at the BUMC Adult Sunday School Classes on October 26 at both the 9:30 AM and the 11:00 AM hours. There will be plenty of time to meet and talk to this remarkable young lady who exemplifies a true PET success story. 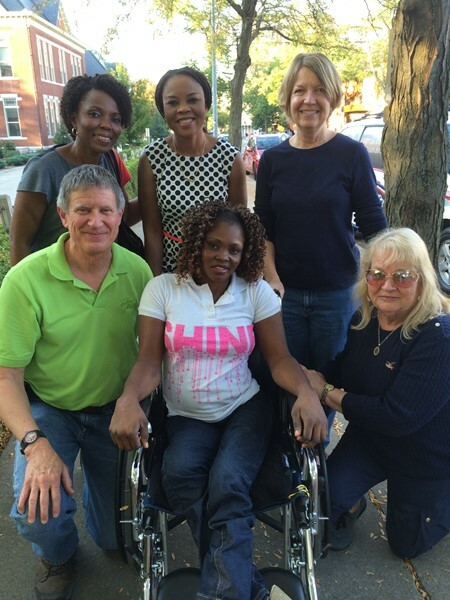 Although mobility was, and continues to be a major challenge to Seun, she has managed with the help of her parents, physicians and friends, both in Nigeria and the US, to doggedly pursue her dreams of having a good job and living independently. Seun has completed what we refer to as high school and has taken some computer training at a local vocational school---traveling to and from school on her PET. Seun now lives by herself in an apartment provided by a compassionate Nigerian businessman not far from her home. With the use of her PET and a conventional wheelchair she is quite self-sufficient, doing the cooking, cleaning and related house work. She is employed in an office nearby doing clerical duties including filing and record keeping. The PET family will be raising money to help Seun further her education so that she can better reach the life goals she has set for herself. Come to Bethany during one of the events to meet this amazing young lady. We received this note from our distibution partner in India. I am sure you will be happy to see how happy Roshan is to have her 'Pet Cart", She started driving it around immediately. After she has it for some days and has a chance to see the value we will have her write about it. We are so grateful to Mr. Ubaldraj Mackenna, District Govenor, 324 - B4 of the Lions Clubs International for making it possible for Roshan to have it. It is such a lovely Cart and so easy to use. May the Lord bless the givers and the recever. This morning Mac McCain of the Del Rio Lions club picked up 14 PETs from the TyRex warehouse. Mac will transfer these PETs to the Acuna Lion's Club to be distributed in Acuna Mexico. We really appreciate Mac's efforts to come to Austin to pick up the PETs. We just received a foundation check from Amazon Smile for the period of April 1 through June 30. 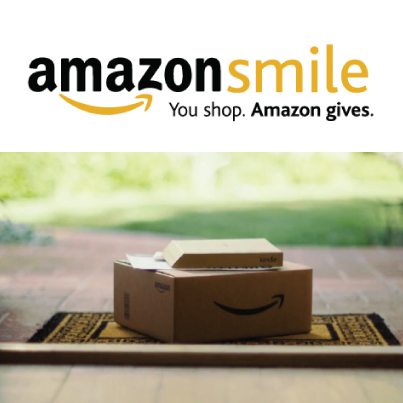 When we shop at smile.amazon.com, we get the exact same convenient shopping experience as Amazon.com, with the added bonus that the AmazonSmile Foundation will donate 0.5% of all purchases designated for PET-Austin. I want to thank everyone that has switched to shopping at Amazon Smile. It makes a difference. If you already have an account with Amazon, your login, password and everything else is the same. The first time you go to smile.amazon.com you will be asked to select a 501.c.3. Enter Personal Energy Transportation of Austin in the charity search window and our name will pop up in the list. Select us and go from there. Be sure to set smile.amazon.com as a favorite so it will be easy to get to every time you shop and help us build more PETs to deliver the Gift of Mobility. We continue to collect money for our new building that will be built on the Bethany United Methodist Church campus. As Bethany’s building program progresses, we should be able to start construction of our building after the first of the year. This is an architectural rendering of what the build will look like. It will be a 3000 square foot building that will give us plenty of room to meet our current needs and grow into the future. The new building will be located just off the parking lot north of the cellphone tower. If you would like to help with the cost of this building, please make your check to PET-Austin and note on the memo line building fund.